A simple recipe for two cups of Small Batch Almond Granola filled with sweet golden oats, sliced almonds, and toasted coconut. Perfect for making in your toaster oven! Small Batch. The two sweetest words any toaster oven cook can hear. From cookies to granola the world is full of fantastic recipes. The problem is that most of them make enough to feed an entire football team. Don’t get me wrong, my husband Tim and I would eat every last cluster of those mega-sized granola recipes. But there’s no practical way to cook a HUGE granola recipe in a LITTLE toaster oven. 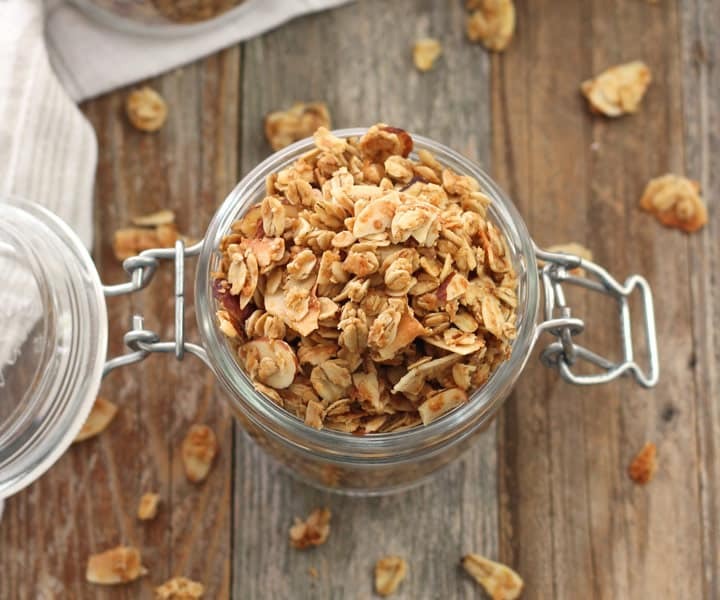 That’s why you’re going to love this light and flaky Small Batch Almond Granola! It’s a simple toaster oven recipe that’s full of ALL the good stuff. Like wholesome rolled oats, toasted coconut, sliced almonds, coconut oil, and maple syrup. Simple is good but sometimes you want to mix-it-up a bit. 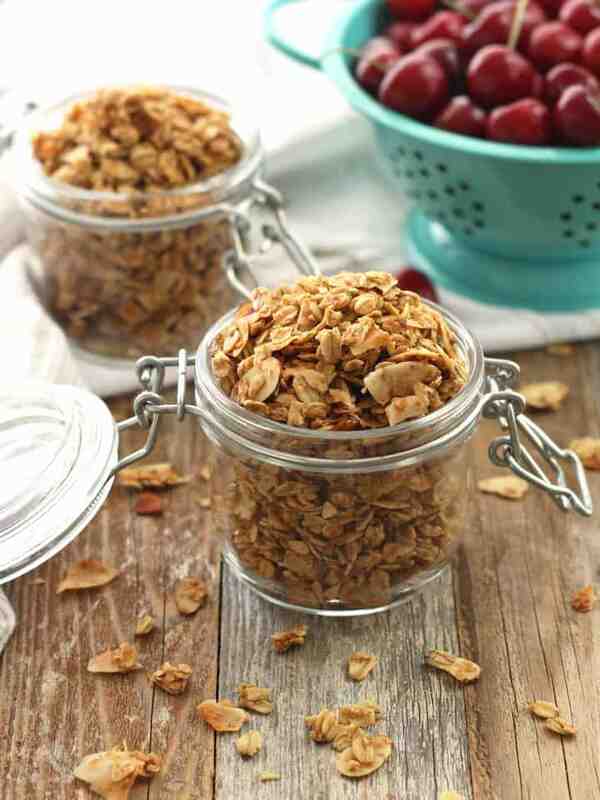 And this granola recipe makes a great base to let your creativity go wild! But there is one DIE-HARD granola making rule you must follow. Dried fruit gets added after the granola bakes. Add a mix of dried or freeze-dried fruits like cranberries or blueberries. Tip #1 – Try A Baking Pan. It’s difficult to stir granola in any oven let alone a little toaster oven. Be kind to yourself and use an 8 x 8-inch baking pan or a 10 x 7-inch cake pan. The higher edges make it easier to keep the granola in the pan and not on the bottom of your toaster oven. Because who wants to clean their toaster oven more often than necessary? Tip #2 – Keep an Eye On The Granola. Watch it closely at the end of the cook time. Granola cooked in any oven will go from beautiful to burnt in a few short minutes. Tip #3 – Check Your Temperature. Have you tested your toaster oven’s temperature accuracy? If your toaster oven runs hot set it at 300°F. The recipe might take longer to bake but burnt granola is such a bummer! A simple recipe for two cups of maple syrup sweetened almond granola. Perfect for making in your toaster oven! Preheat toaster oven or oven to 325 F and lightly oil a 10 x 7 pan. 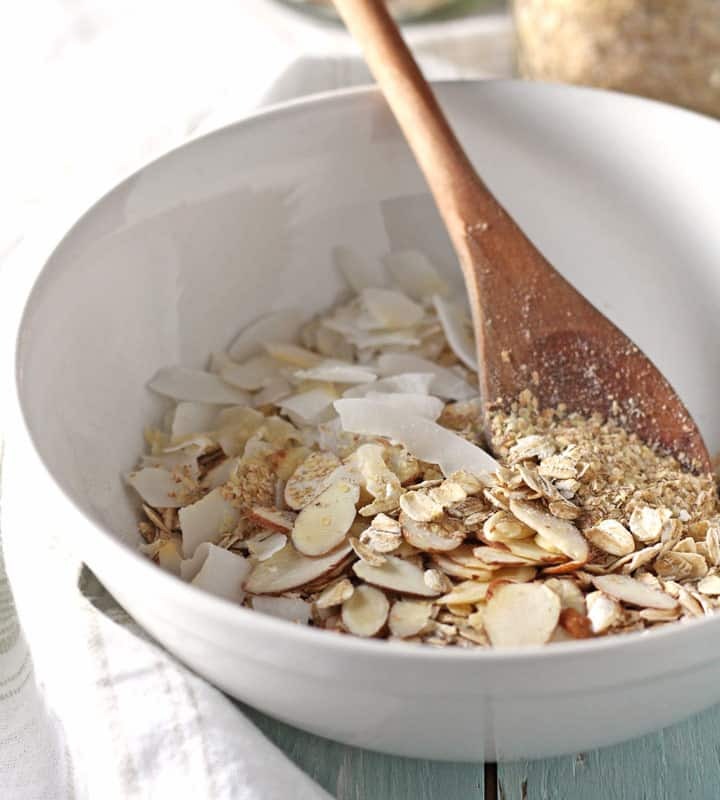 In a medium bowl mix together the oats, wheat germ, almonds, coconut and salt. In a small bowl whisk together the coconut oil, maple syrup and almond extract. Pour the maple oil mixture over the oat mixture and stir well coating all of the ingredients well. Pour the granola into the prepared pan and spread into an even layer pressing the granola down with a rubber spatula. 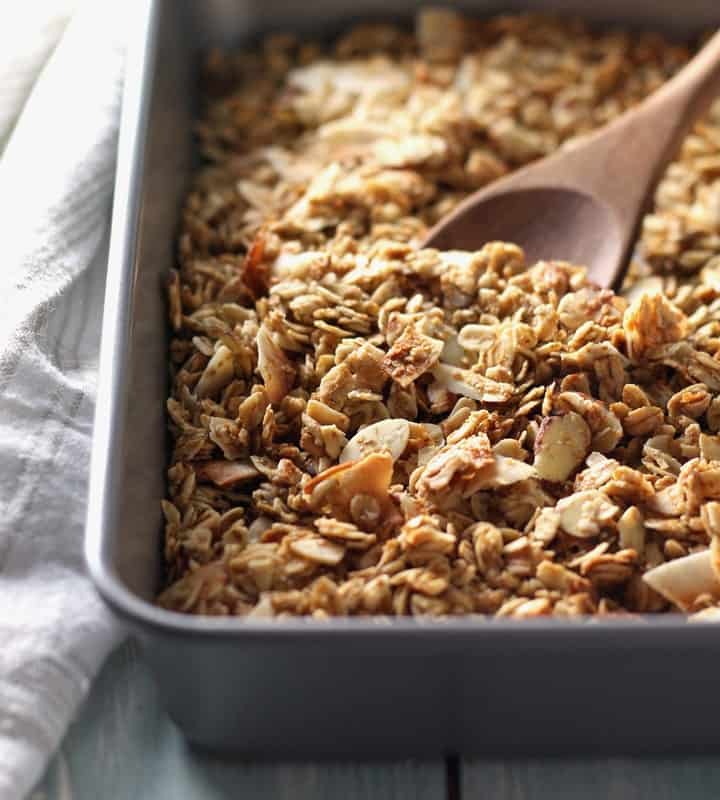 Bake granola for 19 to 22 minutes until golden brown. Stir the granola after 15 minutes, stir from the edges of the pan inward. Keep a close eye during the last few minutes to make sure granola does not burn. 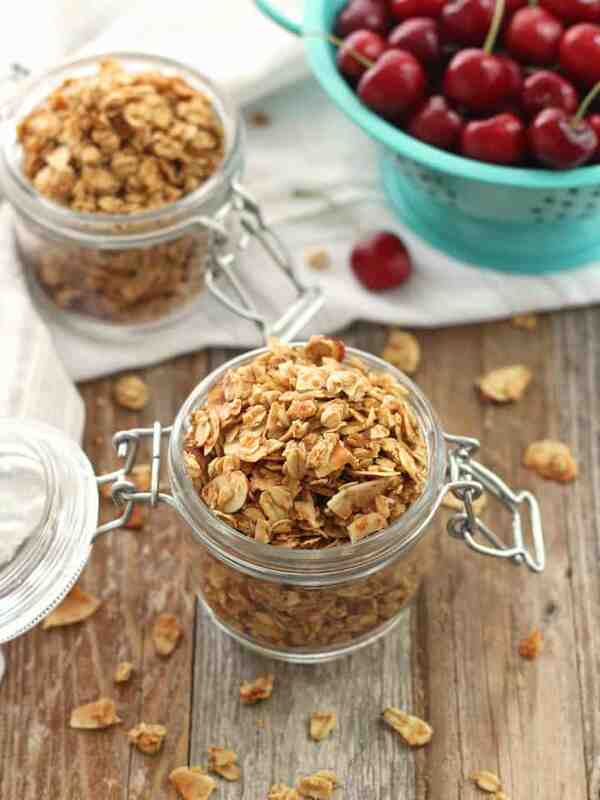 Cool granola completely (about 30 minutes) without stirring before storing in a sealed jar. * Wheat germ is a part of the wheat kernel that is rich in vitamins and minerals. It can usually be found at health food stores, in the baking or cereal aisle at the grocery store or in the bulk bins. Substitute wheat bran, flax meal or chia seeds for the wheat germ. Time does not include 30 minute recommended cooling time. Recipe makes 2 cups total. 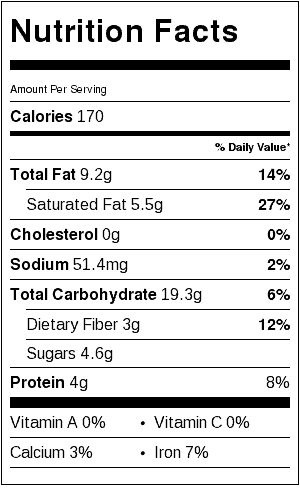 Nutritional information is an estimate for a single 1/3 cup serving. 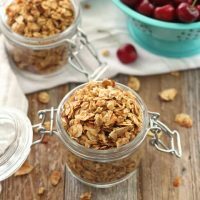 I love that this is a super simple granola recipe that you can use for parfaits to let the other ingredients shine – definitely a must-have for all the summer fruits and berries coming our way 🙂 Pinned! And now I need to go stock up on some cherries!